Smash Sodexo! | Bloomsbury Fightback! 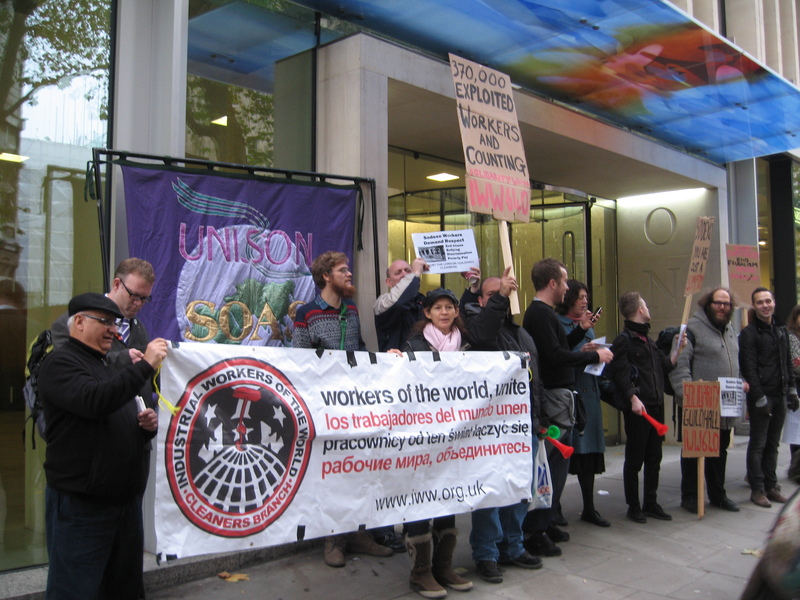 Staff and students from Bloomsbury demonstrated today outside the Sodexo HQ in Holburn, in protest against the appalling treatment of workers at the London Guildhall. Sodexo exploits workers across Bloomsbury in university cafeterias and hotels, as well as at the Guildhall and across London. Globally, Sodexo employs over 370,000 people, and has a track record of union busting, driving down pay, poisoning food, and collaborating in violent, oppressive regimes. A solidarity demonstration also happened in Kansas, USA, by members of the Industrial Workers of the World (IWW), and workers at the Guildhall also protested outside their workplace. The demonstration by Bloomsbury Fightback! was a continuation of the solidarity extended to workers at Senate House and the Movimiento Ecuador en el Reino Unido. « Wildcat strike action at Senate House.. and VICTORY!